Some housing experts are excited about the recent one-half of one percent uptick in the homeownership rate, saying it’s at a three year high. 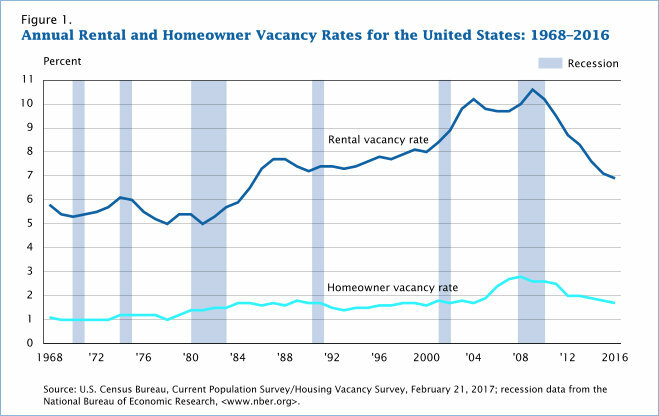 But the Census’ most recent release of the Quarterly Residential Vacancies (Fourth Quarter 2017) and Homeownership described the move as “not statistically different” from the previous quarter or year (census.gov). Essentially, the homeownership rate remains historically low. This dovetails with the Census’ most recent renter moving data indicating that the percentage of renters who moved in 2017 was the lowest since 1988. So, it should not be a surprise that rents are on the rise, and it’s becoming even more difficult to find a rental. How can you find a rental in a tight market? Before you go off and sign a lease, you should create your own “rental guide.” First, make a housing budget of how much you can afford for rent and utilities. Then make a list of “must haves” for your new home. Think about the size, location, local amenities, commuter routes and public transportation, and anything else you deem important. This guide will help you stay focused on your needs, and help you decide on a rental that makes sense. Once you begin looking for a rental, you may realize that finding a rental that “checks all the boxes” may be difficult. You may find that rent per square foot varies depending on the neighborhood, age of the building, and the amenities. This may force you to prioritize your needs. For example, you may find that a small condo near a metro station is the same rent as a three-bedroom single family home that has a longer commute. Or there may be a new apartment available with luxury amenities with a higher rent than the older apartment building with sparse amenities. The internet is the medium of choice these days to look for a rental. There are numerous websites using state of the art applications to advertise rental listings. They also include vast amounts of information on each listing to help your search. There are a number of specialty sites focusing on niche rentals (such as apartments, luxury, etc.) that tout their exclusive listings. However, there are sites that are more comprehensive that include a mix MLS and private listings. And let’s forget there are online classifieds too. Many renters search for their new home without an agent, and that’s ok. But consider that an experienced licensed real estate agent can help negotiate your lease, possibly getting better terms. While most agents will work rentals and sales, there are real estate agencies that specialize in rentals. Consider contacting legitimate property managers or rental management companies and ask about their upcoming rental listings. If a rental listing sounds too good to be true, then be suspicious of a scam. To protect yourself from scammers, it can be helpful to understand how they operate. The Federal Trade Commission (ftc.gov) offers insight on how rental scams work, and how to report scams. Scams are typically from hijacked ads or phantom rentals. The FBI (fbi.gov) and USA.gov also offer tips on protecting yourself from rental scams. -Don’t give out personal information, like social security, bank account, or credit card numbers. Regardless whether you go it alone or with a real estate agent, practice due diligence. Real estate scams have been part of the rental scene for decades. Scams have become more prevalent with the increased reliance on the internet for home searches. And in a tight housing market, it’s no coincidence that real estate scams are on the rise. Next PostNext Mortgage Choice Act good or bad?